These days computers handle a lot of the work for designing an airplane, but when it comes to seeing how well the new design will really handle in the air, there’s nothing like a real-life test in a wind tunnel. NASA’s National Transonic Facility is one of the best—and when the Agency’s engineers aren’t using it to test their own aeronautic innovations, private companies are sometimes able to use the available space by reimbursing NASA for time not already scheduled. NASA is using the National Transonic Facility (NTF) to test the Hybrid Wing Body airlifter, which could be more fuel-efficient and aerodynamic than the traditional airplane shape. The NTF is pressurized and can pump in pure nitrogen gas, which makes it better-able to mimic real conditions in the air than other wind tunnels. But before Honda was ready to invest in a new company offshoot and product line, it needed to test design variables in real-world conditions. “In order to experimentally validate our concept, we were searching for a wind tunnel all over the world,” Fujino recalls. The National Transonic Facility, or NTF, at Langley Research Center, was the clear choice. The NTF “was the first of its kind in the world, and there are only two like it in the world now,” explains Richard Wahls, senior technical advisor to the director of NASA’s Advanced Air Vehicles Program, where the facility is housed. Opened in 1983, the NTF aimed to help design the bigger airplanes that were being developed. “In the 1960s and ’70s, there were always surprises during initial flight tests. For example, the aerodynamic loading might be different than expected if the shockwave over the wing was in a different location than expected,” Wahls says. “But by that stage of the development process, you couldn’t start from scratch, so you had to figure out how to make a fix.” Those kinds of fixes tended to add weight to the plane or were in other ways non-optimal. It wasn’t that nobody had wind tunnels. They did, including NASA. But none of them corrected for an important problem: the models of aircraft used for testing were much smaller than the real thing, often as much as 50 times smaller, while the molecules in the surrounding air were the same size. HondaJet was tested at the NTF to see whether the computer models of its innovative over-the-wing engine mount were accurate in real flying conditions. The successful test results gave the company more confidence to move to the commercial phase. The mathematical term that expresses that relationship is called the Reynolds number. To partially correct for these Reynolds-number disparities, the NTF, like several other wind tunnels, is pressurized, so the air can be compressed proportionally to the scale of the aircraft. However, to simulate large aircraft, this pressurization is not enough to match flight conditions. To finish the job the NTF can also pump in pure nitrogen gas at temperatures as low as -250 °F, which further increases air density to simulate the real conditions airplanes experience at altitude. NASA has used the NTF for many projects, including foundational research on how air flows over simple shapes at different Reynolds numbers, which can improve computational models. The Agency has also tested innovations in aircraft design there—some of which, like the winglet, have become standard in modern jets. Today NASA uses the NTF to test advanced aircraft concepts like the blended wing body, a flattened, triangular design that could one day replace the more familiar airplane shape of a tube fuselage with wings sticking out. When the Agency doesn’t need the NTF, private companies can step in to take advantage. These contracts can be cooperative, where NASA and the company share the costs and the resulting data, or fully reimbursable, where the company pays for the wind tunnel time in full and retains full rights to its data. Honda Aircraft negotiated the second type of contract, Wahls says. Fujino and his team had already mostly designed their aircraft but needed to do final testing. 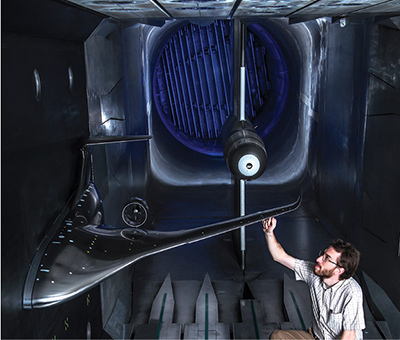 The team worked with NASA wind tunnel experts in advance to ensure their model, 10 percent the size of a full-scale jet, was properly designed to withstand the highspeed testing and could interface with all the instruments. Then they underwent a week of testing, from which they gathered “several tons of data from the very efficient NASA experiment process,” he says. Fujino says the test allowed him to choose the best among several options for the fairing of the over-the-wing engine mount configuration, but mainly it proved the existing design worked as expected. The over-the-wing engine mount design allows the plane to fly faster using less fuel, but it also increases space and comfort in the cabin, since the engine is no longer attached to the plane body. 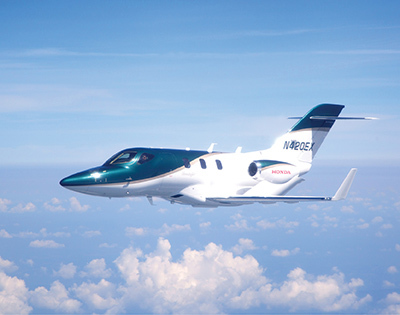 Following the wind tunnel testing in 2005, Honda launched its general aviation subsidiary Honda Aircraft in Greensboro, North Carolina, where 1,700 workers are employed to manufacture the planes. The key innovation of the new jet is the over-the-wing engine mount, a major departure from previous light jets, which generally mount the engine on the fuselage, the main body of the aircraft. Mounting the engine over the wing can interfere with air flow, but Honda’s design, born out in the NTF testing, found a “sweet spot” that actually reduced the shockwave, thereby decreasing drag. 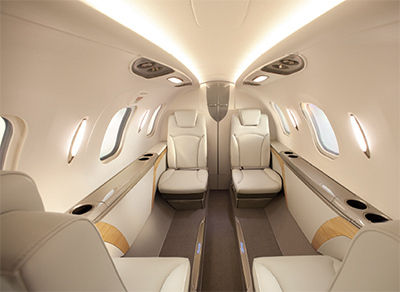 As a result, the HondaJet has the fastest maximum cruising speed in its class, 422 knots (nearly 500 mph), and can fly at a maximum altitude of 43,000 feet, also highest in its class. 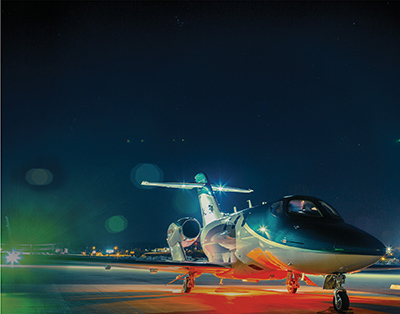 The light jet recently set two speed records, flying from Teterboro, New Jersey, to Fort Lauderdale, Florida, in just two hours and 51 minutes, and from Boston, Massachusetts, to Palm Beach, Florida, in two hours and 58 minutes. The lower drag also increases the jet’s fuel efficiency, which makes the airplane less expensive to operate than other light jets. Honda Aircraft estimates its engine configuration uses up to 17 percent less fuel over a given distance than typical configurations, assuming similar flight conditions and operator. Mounting the engine over the wings also increases passenger comfort, Fujino says: there is more room in the cabin, because the engine isn’t taking up any space, and vibrations don’t transfer, reducing noise. The company markets to owner pilots and to small business owners who need to travel frequently. It began delivering jets in late 2015 and has already sold more than 100, with prices starting around $5 million, in North and South America and Europe. The company has recently expanded sales to Central America and is looking to the Middle East as well. And back at Langley, the NTF continues to test the cutting edge in aeronautics. “You can think about it as risk reduction,” Wahls explains. “Someone has an idea and it’s on paper, but you need to make it real. Part of making it real you can do with CFD, and that’s come a long way, but you still want to see some experimental data.” And that’s something that can be done at the NASA facility better than almost anywhere else in the world.